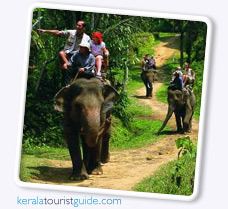 Kerala safari is an overland journey. Elephants are made ready with a specially constructed wooden saddle on top, designed to make the riding comfortable and safe. Elephant safari helps the visitor to travel through such difficult terrains where even jeeps cannot venture. And why not, riding an elephant takes you back to the royal era, when only the kings use to ride on these majestic beasts, since nothing can even compare with the majesty of the Pachyderm. The elephant moves slowly and steadily, that's why this type of safari is ideal in and around the wild regions or within the vicinity of the wildlife sanctuaries, where riding the elephant can give you an easy excess for viewing the wildlife.